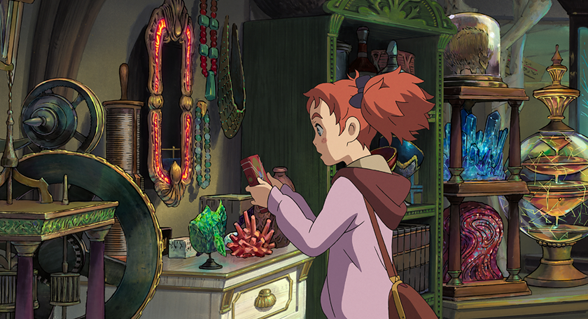 GKIDS Films will premiere Mary And The Witch's Flower, the new film from Hiromasa Yonebayashi (director of Arriety and When Marnie Was There) at the Animation Is Film festival. But when can American audiences who can't make the festival get their chance to see it? The wait won't be too terribly long, as it will hit cinemas in January 2018. Mary and The Witch's Flower is the debut feature from Studio Ponoc, which was founded and staffed by ex-Studio Ghibli employees. Based on a novel by Mary Stewart, it looks set to fill a Ghibli-shaped hole in our lives (at least until that new Miyazaki movie comes out). Mary, an ordinary twelve-year-old girl, is bored and lonely during a summer holiday. She follows an odd cat into the nearby woods where she stumbles upon a flower and then a little broomstick. Together the flower and broomstick whisk her above the clouds, far away to Endor College - a school of magic! At Endor, Mary tells a lie that leads to peril, and then a promise, while discovering that all is not as it seems at the school - there are experiments that horrify. Soon she confronts great danger, and a test of her resolve. The film will debut as a one-night-only event on January 18 in association with Fathom Events. The screenings will be accompanied by an exclusive interview with the film-makers. It will screen in both the original language version and with the new English dub (featuring Ruby Barnhill, Kate Winslet and Jim Broadbent). Tickets are available from Fathom's website or via participating cinemas. The film will then get a traditional nationwide release with regular screenings starting January 19. Details of this release will be confirmed later.